Live streaming shouldn’t be complicated! Webcaster X2 is a dedicated encoder designed from the ground-up for live streaming to YouTube and Facebook, making streaming a breeze. Pair your device once with your accounts and it remembers your settings for all future streams. Webcaster X2 streams your live video to your choice of Facebook Live or YouTube. Switching between them is simple, and Webcaster X2 remembers all your settings for both YouTube and Facebook Live. Choose to stream to your Facebook Timeline or any Group, Event or Page you administer. On YouTube, choose to stream live now, or publish to a scheduled event. Connect a mouse and monitor to Webcaster X2 for additional configuration options. 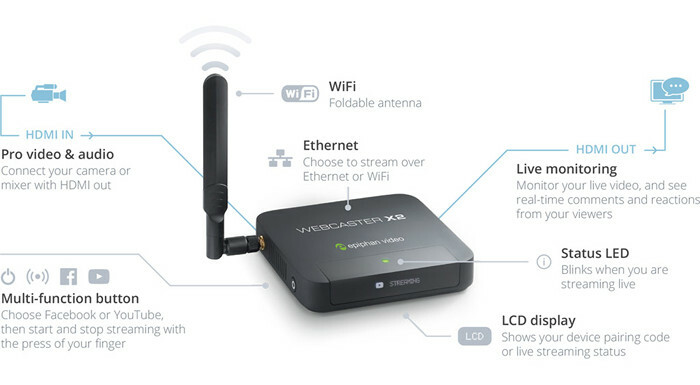 Webcaster X2 is designed specifically for streaming to Facebook and YouTube. Set up is easy with a simple device code to pair it to your accounts, the rest is done for you - the device comes preconfigured with optimal encoding settings for YouTube and Facebook Live streaming. Stream any HD camera, mixer or display by connecting it to the Webcaster X2's HDMI in port. Connect any wired or wireless mic to your camera and get professional HDMI audio quality. Webcaster X2 encodes your high quality audio along with your video and streams it to your Facebook or YouTube audience. Use WiFi or Webcaster X2’s wired Ethernet connection to stream the way that works for you.